The typical person likely doesn’t get enough iron in their daily diet. However, did you know that iron bacteria can wreak havoc on your plumbing? Sometimes, the soil around your home is rich in iron, which will eventually combine with the water under your property. Once it enters into the plumbing network, it can pose significant clogs. As the iron mixes with water, it creates a compound that solidifies when it gets exposed to air. 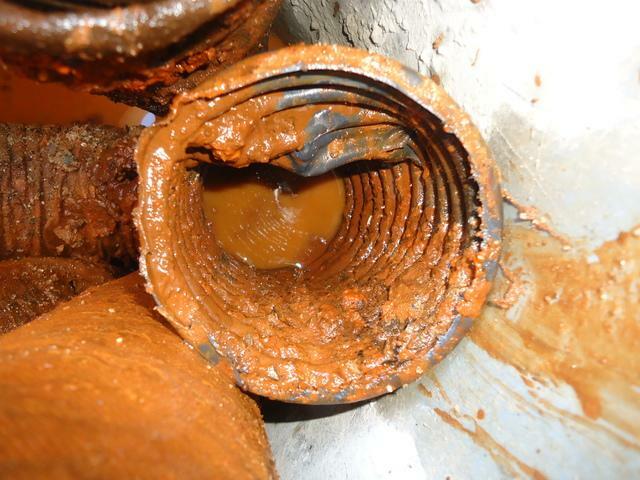 Before you know it, you have a thick, hard, cement-like substance clogging your pipes. Savings Sewer & Drain has the experience you can trust, and our experienced team knows how to treat iron ochre issues. When your plumbing is full of ochre, we remain the best choice each time. Chances are, you know what iron ochre looks like even if you might not understand what it is. If you have ever entered your basement and discovered a strange rusty leak forming around your water heater, that is the effects of iron ochre. Once the bacteria forms, the texture thickens, like a gel or industrial fluid. Because the contaminated water sticks to the plumbing components, it can rot your pipes from the inside. The thicker body also makes it more difficult for water to pass through your home’s piping, causing backups and overflows. As a result, your home can fill with odor, bacteria, and other health concerns. When you discover evidence of iron ochre in your tubes, you must remove it as quickly as possible. The longer that the bacteria compound remains, the more damage will get caused to the plumbing components. Unfortunately, to remove it successfully requires professional plumbing tools and equipment. When you call us to eliminate your ochre issues, we utilize our powerful sewer jetting spray to blast it from pipes. Once the issue has gotten removed, we then seal any gaps we find around tubes and joints. We want your home to remain safe from future ochre as long as possible. Don’t wait for iron bacteria to eat away at your home’s plumbing systems. Contact us for the best in local ochre removal service.